While implementing Citrix XenApp 6.5 Hotfix 2, I had few issues with Storefront. Here I would like to share my experience/ issues and fixes. Note: Refer to this article if you want to add second Storefront server for HA purposes. One of the issues I faced after installing Storefront 1.2 (which comes with XenApp 6.5 download), Storefront keep crashing with MMC Error as follows. I tried multiple things like installing latest Microsoft patches with certificates and other things. To return to MMC and check the status of the snap-in, click cancel. Finally I decided to download and install latest Storefront version i.e. 2.1. I managed to install successfully but while opening console, it’s VERY slow (couple of minutes) and crashes with error messages as follows. MMC has detected an error in a snap-in and will unload it. · Open Internet explorer and navigate to Internet Options- Advanced and go to Security tab. 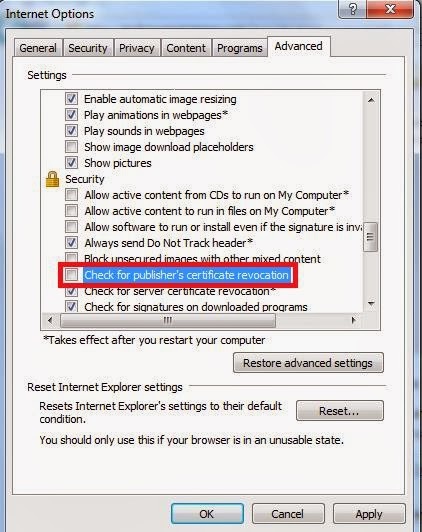 · In security tab, UNCHECK “check for publisher’s certificate revocation” and then click OK twice. · Then reopen the Storefront console from Start – Programs, it should fix the issue. Citrix receiver slow applications launch issue article but you need to execute these steps on client machine where Citrix receiver installed. Many thanks. Very helpful post. Thank you for the great post. It really solved the 2 hrs of misery trying to debug the problem. I downloaded a lot of root certificates and tried several things to see what is the problem. Great work! no its not working for me.